"Let us proclaim to every soul. - Arise, awake and stop not till the goal is reached. Arise, Awake from hypnotism of this weakness"
During his travels all over India, Swami Vivekananda was deeply moved to see the appalling poverty and backwardness of the masses. He was the first religious leader in India to understand and openly declare that the real cause of India’s downfall was the neglect of the masses. The immediate need was to provide food and other bare necessities of life to the hungry millions. For this they should be taught improved methods of agriculture, village industries, etc. It was in this context that Vivekananda grasped the crux of the problem of poverty in India (which had escaped the attention of social reformers of his days): owing to centuries of oppression, the downtrodden masses had lost faith in their capacity to improve their lot. It was first of all necessary to infuse into their minds faith in themselves. For this they needed a life-giving, inspiring message. Swamiji found this message in the principle of the Atman, the doctrine of the potential divinity of the soul, taught in Vedanta, the ancient system of religious philosophy of India. He saw that, in spite of poverty, the masses clung to religion, but they had never been taught the life-giving, ennobling principles of Vedanta and how to apply them in practical life. Thus the masses needed two kinds of knowledge: secular knowledge to improve their economic condition, and spiritual knowledge to infuse in them faith in themselves and strengthen their moral sense. The next question was, how to spread these two kinds of knowledge among the masses? Through education – this was the answer that Swamiji found. It was when these ideas were taking shape in his mind in the course of his wanderings that Swami Vivekananda heard about the World’s Parliament of Religions to be held in Chicago in 1893. His friends and admirers in India wanted him to attend the Parliament. He too felt that the Parliament would provide the right forum to present his Master’s message to the world, and so he decided to go to America. Another reason which prompted Swamiji to go to America was to seek financial help for his project of uplifting the masses. Swamiji, however, wanted to have an inner certitude and divine call regarding his mission. Both of these he got while he sat in deep meditation on the rock-island at Kanyakumari. With the funds partly collected by his Chennai disciples and partly provided by the Raja of Khetri, Swami Vivekananda left for America from Mumbai on 31 May 1893.
to focus the attention of educated people on the plight of the downtrodden masses, and to expound his plan for their uplift by the application of the principles of Practical Vedanta. It may be mentioned here that in the West many people were influenced by Swami Vivekananda’s life and message. Some of them became his disciples or devoted friends. Among them the names of Margaret Noble (later known as Sister Nivedita), Captain and Mrs Sevier, Josephine McLeod and Sara Ole Bull, deserve special mention. Nivedita dedicated her life to educating girls in Kolkata. Swamiji had many Indian disciples also, some of whom joined Ramakrishna Math and became sannyasins. 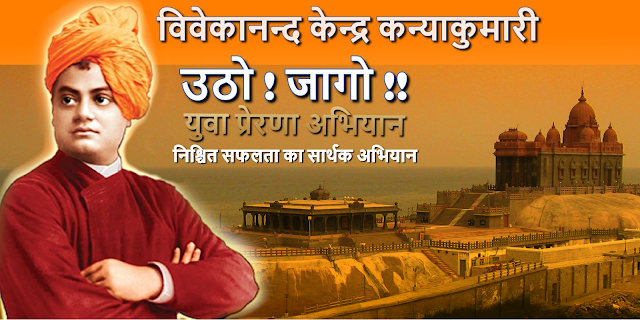 "Vimarsh" is Vivekananda Kendra’s flagship event held every year in different parts of country. Vimarsh event’s aim is to inform elaborately on key topics of national importance by apt & influential persons to the people and students in particular on how they can contribute in solving such problems or preventing any such in future. In the past, many eminent people like Subramanian Swamy ji were part of this event when it held in Jabalpur. This year we have organized Vimarsh at Jabalpur and it was special Vimarsh as topic was vibrantly different from previous topics as it focuses on regional and national aspect of geographical problems. Apart from notable people from Jabalpur across all walks of life like education, medical, govt, civil, law, etc, Students attendees were main focus on this event as they are the one to shape Bharat’s future thus college students were prevent in masses. Also this year, we have organized a special competition to select highly motivated students to provide them opportunity to meet Bakshi ji in person. विवेकानन्द केन्द्र कन्याकुमारी, शाखा जबलपुर. Simple theme. Powered by Blogger.